On February 4th at 6 p.m. the Ducks‘ basketball squad will be taking on the Huskies at Matthew Knight Arena. After coming off a close 68-67 win to the Sun Devils, Oregon will be attempting to redeem themselves against Washington, who beat them back on October 18th at 85-77. Currently, the Ducks are ranked higher at 15-7 while the Huskies are 14-6, but Oregon does have the upper advantage heading into this game mostly due to the amount of time they have to prepare for this game. Going back to Oregon’s performance in their previous game against the Huskies, the Ducks didn’t play hard nor mount a solid defense. For instance, when the Ducks were leading at halftime with at 42-32, the Huskies came out in the second half showing Oregon that they weren’t going to allow them to win on their home court. When there were about 13 minutes left in the game, Washington was already ahead of the Ducks dominating them both offensively and defensively. 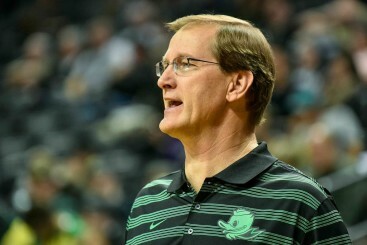 Dana Altman’s three-word memoir for this week: Defense, Defense, Defense. The shining star or pivotal player who gave the Huskies the big “W” over Oregon was true freshman Donaven Dorsey. In the second half during Washington’s 11-point run, Dorsey scored a pair of 3-pointers that ultimately sealed the deal for the Huskies. At the end of the night, the freshman finished with 3/3 from the 3-point line and 13 solid points coming off the bench. All in all, because of Dorsey’s stellar performance against Oregon that night, the Ducks were never truly able to get their act together and beat Washington. For the high-flying Ducks to annihilate the Huskies next Wednesday, Oregon will need to develop a game plan that centers on certain aspects of their defense. As I mentioned earlier in the article, the Ducks gave up on the defensive side of the ball game in the second half. Little did they know that the Huskies were not ready to give up and they came back big time. Oregon will need to focus on shutting down junior Andrew Andrews, who scored a season-high 21 points in that game. Plus, they will obviously need to keep Dorsey on a leash in order to not let him score big three’s like he did the last time these two teams met. There’s no doubt in my mind that Oregon’s head coach Dana Altman will be preaching defense to his players throughout this week. This season the Ducks’ offense has been able to find its grove despite being in tough positions such as against Arizona. However, if the Ducks are able spread the ball around and guard strong on defense, Oregon will win the day.